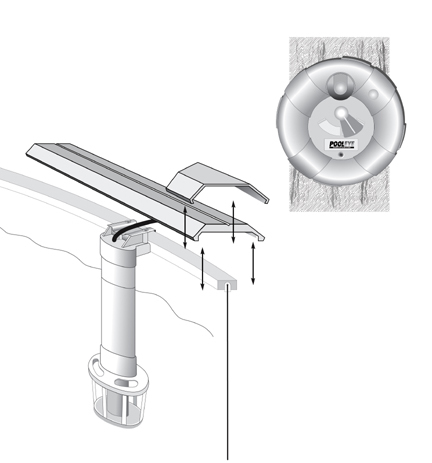 This alarm patented underwater wave detector protects your pool, while eliminating false alarms due to wind or rain. The sensor discretely mounts inside the pool and detects when objects weighing 15 lbs. or more enter the pool. You can also adjust the sensitivity. The alarm emits a loud siren at the control panel mounted on the pool or nearby. The control panel has an on/off switch, low battery alert and power check reset button. Easy to install and operate. Maximum Pool Size 24 round or 16 x 32 Oval. Comes complete with mounting hardware and instructions. Requires 4 'AA' batteries (not included). Backed by a 1-Year Manufacturer Warranty. A great alarm at this great price! Click here for more information and the installation guide.